Hello hello and happy 21-days-until-Halloween-day!! Well, on the west coast it’s still 21 days away- WordPress, why you gotta say that I published this post on the 11th?!? I LOVE Halloween for reasons like carving pumpkins, roasting seeds, dressing up in costumes, the colors orange and black (obviously), and watching movies like Hocus Pocus and The Nightmare Before Christmas (no scary movies here!). Tonight, I decorated my house and made these scones, and this weekend I plan on getting my pumpkins to carve later- I can’t wait! In a large bowl or stand mixer, mix together the first seven ingredients. Add in the butter cubes and mix until butter has broken up into pieces about the size of a dime. Add in pumpkin, vanilla, and eggs, mixing until just combined. The dough should be pretty shaggy, with visible butter pieces, but should come out of the mixing bowl in one big chunk. Separate the dough in half, and form each half into discs about 6″ across. Cut each disc into 6 wedges, and place wedges on a baking sheet. 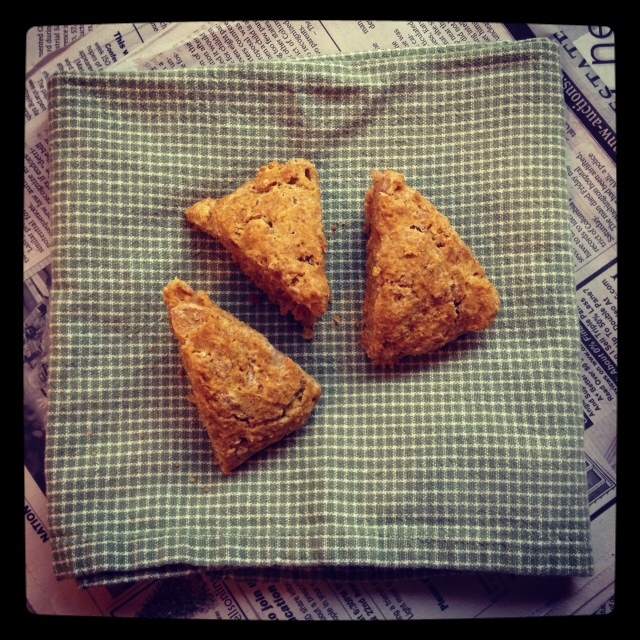 Bake scones 20-25 minutes, until cooked through and golden brown on top. P.S. I’m still mulling over ideas for what to carve into my pumpkins this year, anybody have a good idea? ?